Regular readers will by now know that VE, alongside our trading arm Molecula, are stalwarts at this once-a-year event, and as usual we’ve been looking forward to it all year – a bit like greeting an old friend. Not only do we love Amsterdam, but we’ve also sold well here over the years, and have made some great contacts. Cadmium specialises in high quality 20th Century design furniture, lighting and objects from Scandinavia, Italy, France and the Netherlands. Their website is very clean and user friendly, with an host of unusual design pieces, such as this rare ‘Gilda’ Circle Sofa by Michel Ducaroy, designed in 1972 and made by Ligne Roset. With more than 20 years experience in the field, Galerie Gaudium have built up a long-term relationship with satisfied clients in more than 25 countries, and specialises in 20th century design by the most iconic architects and designers. Based in The Netherlands, De Myx sells a wonderful selection of vintage design, specialising in Dutch designers such as Pastoe and Teeffelen as well as Scandinavian and German designers. Vervlogenjaren is another design dealer that faithfully exhibits at Design Icons Amsterdam – and that’s not because her son and Daughter-in-law run it – it’s because it’s Holland’s greatest design event! Wieke Akkerman always brings a wonderful eclectic range of stock from across all categories to the show. 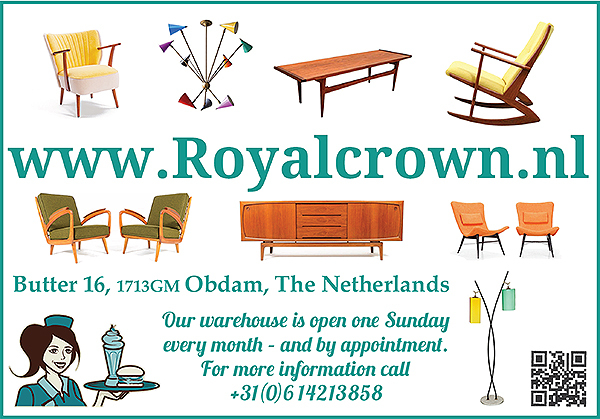 Based in The Netherlands, Royal Crown deals mainly with items from the 1930s to the present day, with a focus on Mid-century Modern. Their stock boasts well-known names such as Arne Wahl Iversen, Knoll, Fase, Eames, Jalk, Halabala and Pastoe to name just a few. Based in Belgium, Pellegrini Designs buy and sell vintage classics from all over the world, including the most famous designers such as Charles and Ray Eames, Le Corbusier, Arne Jacobsen, Ludiwig M. VandeRohe, Poul Kjaerholm and Joe Colombo. Jan Willem and Soraya van de Vreugde started their company in 1999 in one of the oldest areas of Amsterdam, the Jordaan district, which at the time, was one of the very first vintage design shops in the Netherlands!